easyname Review 2019: Is easyname a Good Hosting? By providing wide-ranging language support and an easy install feature for many of the most popular Content Management Systems, Easyname provides web hosting solutions that are accessible to almost anyone with basic hosting needs. Easyname has been in the hosting business since 2005. They are one of the smaller-sized hosting providers who manage to keep up with some of the big boys and the shifting modern standards. At the moment, they have over 750,000 domains registered with them. They provide support for multiple languages including English, French, Turkish, Spanish, and Russian as well as numerous currencies from Pounds to Euros to Dollars. 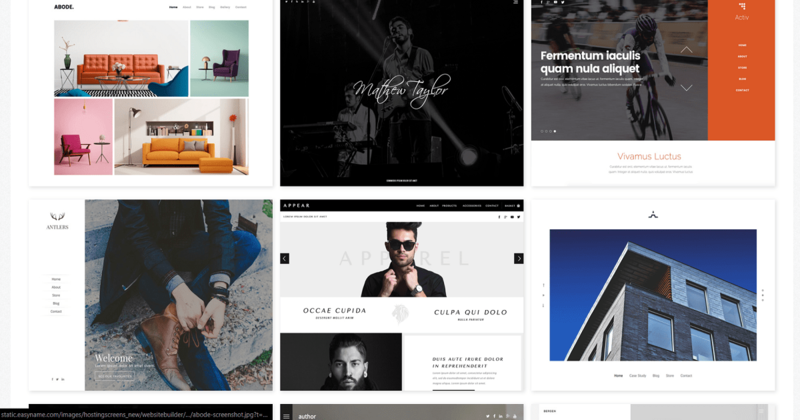 Website builder: They also have their very own website builder. The only downside is that you only get five pages for free. However, it comes with templates and integrations. You can also purchase additional features for an extra monthly fee. As a lesser-known hosting provider, I was pleasantly surprised by the Easyname platform. The main dashboard is very easy to use and one of the more modern and polished ones out there. This is where you manage your website, account, and auxiliary features like the databases and webmail, so it’s important to have everything accessible yet not cluttered. They also don’t bog you down with as many upsells as other platforms when signing up, as they seem to take their “3 minutes from your own domain” slogan seriously. Pricing for Easyname hosting is divided into two broad categories: Easyname Products and Reseller Products. The former is meant for customers who will only be managing their own websites and don’t need possibly limitless resources. The latter is more for agencies who might be managing websites on behalf of multiple clients or who have extensive needs. Generously, you get all other features with all plans as well as unlimited subdomains and data traffic. Similarly, the Reseller Products come in four categories: Starter, Basic, Medium, and Premium. All packages come with unlimited traffic, SSL certificates, databases, subdomains, and FTP accounts, with only a difference in storage space. Unfortunately, there is no live chat support on Easyname. However, there are multiple support emails for different aspects and an international phone line which is only available at certain hours. Email support isn’t the best, considering it did take me a few hours to a day to get a reply to some queries. However, the staff was helpful enough. If you’re an individual looking for affordable and simple hosting for your own website or a small agency managing multiple websites for your clients, Easyname provides a convenient solution. However, the shared hosting might not be suitable for those with high traffic volumes. Wondering how easyname stacks up against other Web Hosting companies? Enter any other Web Hosting company and we will give you a side-by-side comparison.